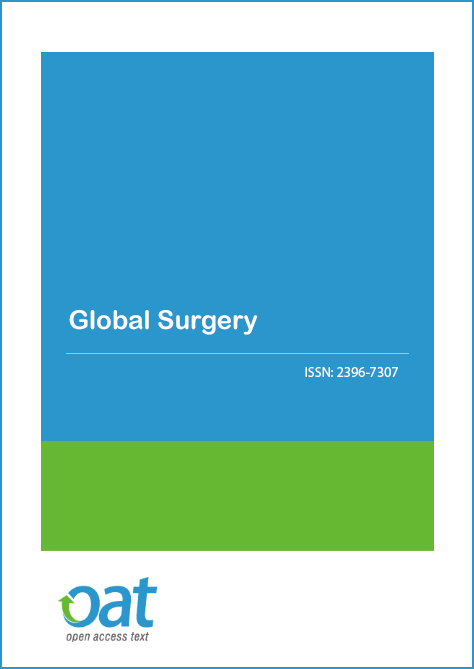 Global Surgery is an open access journal with a comprehensive peer review policy, and a rapid publication process. Surgery journal features the very best in clinical and laboratory-based research on all aspects of surgical procedures and interventions. Patient care around the peri-operative period and patient outcomes post surgery are key topics for the journal. Surgery journal welcome contributions that can demonstrate near-term practical usefulness, particularly contributions that take a multidisciplinary / convergent approach because many real world problems are complex in nature. Contributions regarding patient satisfaction, preference, quality of life, and their role in optimizing new surgical procedures will be welcomed. Surgery journal is characterized by the rapid reporting of case reports, clinical studies, reviews and original research, and more - all offering significant contributions to knowledge in clinical surgery, experimental surgery, surgical education and history. Surgery journal aims to promote publications from surgery faculty members who are otherwise unable to access other journals. Most importantly, those from countries or regions that have few resources to provide surgical care now have a forum to publish their approaches, research, and dilemmas in patient management -- specifically within surgical fields -- through clinical care, research, and education. Surgery journal provides an ideal forum for exchange of information on all of the above topics and more, in various formats: full length and letter length research papers, survey papers, work-in-progress reports on promising developments, case studies / best practice articles written by industry experts, and tutorials on up-and-coming technological breakthroughs that will be of general interest to a broad range of surgeons and surgical researchers. Submissions do not have to be novel or unusual, but need to reflect best practice. Global Surgery is an Open Access journal and we do not charge the end user when accessing a manuscript or any article. This allows the scientific community to view, download, distribution of an article in any medium, provided that the original work is properly cited, under the term of "Creative Commons Attribution License". In line with other open access journals we provide a flat fee submission structure on the acceptance of a peer-reviewed article which covers in part the entirety of the publication pathway (the article processing charge). The process includes our maintenance, submission and peer review systems and international editing, publication and submission to global indexing and tracking organisations and archiving to allow instant access to the whole article and associated supplementary documents. We also have to ensure enough investment to secure a sustainable model which ethically, legally and financially stable. The publication charges for Global Surgery are GBP 1690.